Don't let the adorable cover art fool you, 'Spy Seal' #1 by Rich Tommaso is full blown spy thriller that is as charming as it is exciting. It's Britain during the Cold War and Malcolm Warner is a seal out of work and looking for a distraction from the tempestuous world affairs he reads about in the paper. He accompanies his friend Sylvia to an art show and all hell breaks loose. Tommaso creates a vibrant and colorful anthropomorphic world full of human-like seals, bunnies, dogs, cats, birds, etc. The art style is clean and appealing. If the themes weren't so mature this would make a great children's book. Thankfully, it's an intriguing spy thriller that gains steam midway through the book and keeps rolling. Malcolm becomes a man seal of action when the moment arises giving him a new outlook on life. He inadvertently thwarts an assassination attempt and becomes embroiled in an international incident. Malcolm becomes Spy Seal. Tommaso does a great job pacing the story, It's informative without weighing the story down with a lot of exposition. He makes Malcolm decisive and confident without being cocky or aloof. The other characters develop naturally without feeling forced and the art is just a visual treat. It really is "reminiscent of The Adventures of Tintin and Usagi Yojimbo," as it describes itself. 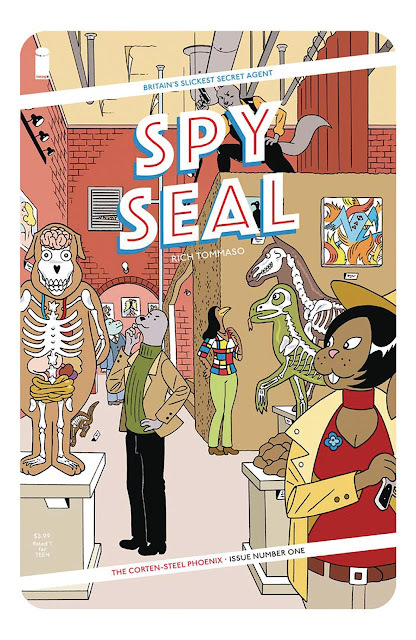 'Spy Seal' is a fun spy adventure with darker undertones that works on different levels. It's a subversive tale of Cold War espionage that's well-paced and entertaining. This is a solid read worth your time.